Sports franchise valuations are eye-popping ever since Steve Ballmer bought my Los Angeles Clippers for $2 billion. With the Clippers at $2 billion, Forbes values the New York Yankees at $4 billion, which is $3.99 billion more than George Steinbrenner bought the team in 1973 from CBS. Until the late 1980’s, CBS lived up to its name as the Tiffany network as it was the consistent ratings leader (ABC did have a run at #1 in the late 1970’s). It was the home of Edward R. Murrow, Walter Cronkite, 60 Minutes, I Love Lucy, Gunsmoke, and All in the Family. Yet their venture in sports ownership failed to live up to its nickname. The New York Yankees was the most successful American sports dynasty. With stars like Babe Ruth, Lou Gehrig, Joe DiMaggio, and Mickey Mantle, they won over 20 World Series by the time the team lost the 1963 and 1964 World Series. CBS decided to buy the team after the 1964 season by buying 80% of the team for $11.2 million. What CBS didn’t know at the time was that the team was in the decline as Joe Pepitone was no Mickey Mantle and the Kansas City Athletics under new owner Charlie Finley wasn’t going to be a gullible trading partner for them anymore. In 1965, the Yankees had their first losing season in 40 years. In 1966, they finished in last place, which was the first time since 1912. It also didn’t help that Yankee Stadium was crumbling, just like the surrounding neighborhoods in the Bronx. The stadium was in such disrepair and to avoid a Yankees move to New Jersey (like the Giants would announce), the City of New York in 1972 bought the stadium with the idea of renovating the Stadium. So help was on the way with a plan to renovate the stadium and the team was starting to be more competitive with the help of a young catcher by Thurman Munson. However, CBS decided it didn’t want to be in the baseball team owning business. 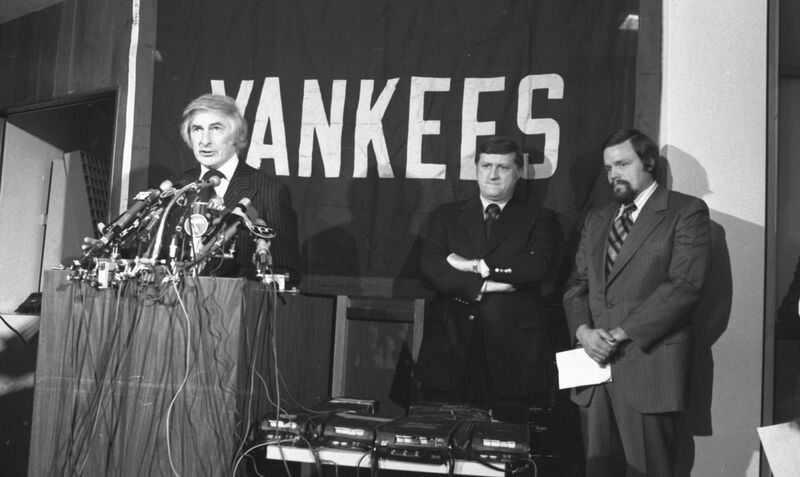 In January 1973, they sold the Yankees to George Steinbrenner and his partners for $8.7 million. For many years, the selling price was reported to be $10 million. However, George Steinbrenner later revealed that the deal included two parking garages that CBS had bought from the city. Soon after the deal closed, CBS bought back the garages for $1.2 million. The net cost to the group for the Yankees was therefore $8.8 million. The reason for the deal is that CBS didn’t want it publicly known how bad the Yankees deal went for them. Yankee Stadium was closed for renovations as the Yankees played at Shea Stadium in 1974 and 1975. A renovated Yankee Stadium was open for business in 1976 and the Yankees won the first pennant since 1964, right before CBS bought the team. After World Series victories in 1977 and 1978, the Yankees were once again a dynasty. CBS owned the Yankees for 8 seasons and only once did they finish above 4th. People will say that the Yankees became winners again because of free agency and Steinbrenner’s checkbook in signing Catfish Hunter, Reggie Jackson, and Goose Gossage, but CBS threw in the towel while it seems that the light at the end of the tunnel for the Yankees was right there.